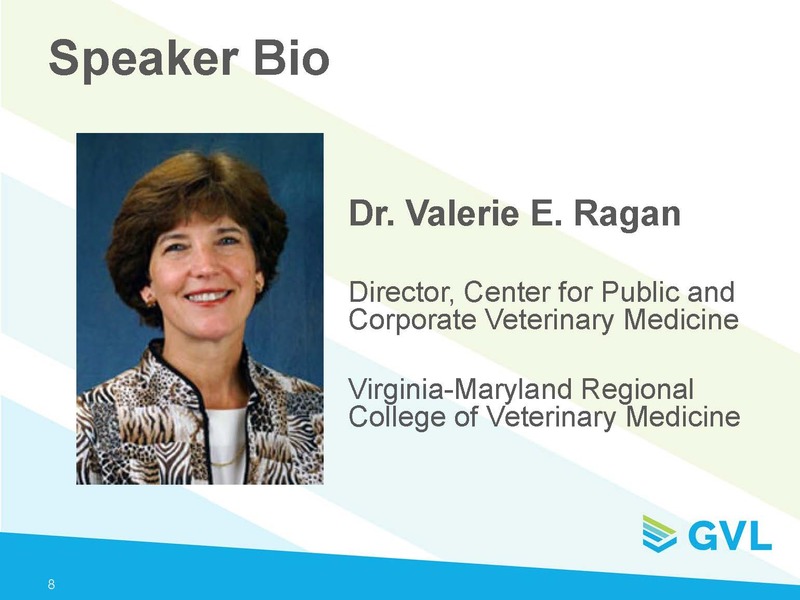 In the Small Animal Requirements for Movement and Travel webinar, Dr. Valerie Ragan presented on the current regulations around animal movement, what changes may be on the horizon, and what animal health professionals can do to prepare. We shared the webinar recording and resources on the GVL blog, and have now summarized the Questions and Answer session here. First, Dr. Ragan has a few clarifications and corrections to some of the information that she provided. Additional details on these topics can be found in the webinar Q&A outlined below. Although accreditation is needed for international health certifications and most interstate health certificates, some state veterinarians may allow small animal CVIs to be issued by licensed non-accredited veterinarians. If you are not accredited and are asked to write an interstate health certificate, be sure to check with the state veterinarian for the state of destination to see if they may accept it. Please see additional information on accreditation below. To clarify about the circumstances under which it is appropriate to issue an ICVI which was acquired from a specific state (in other words, the ICVI has that state’s logo on it): A CVI with a state’s logo on it is typically only issued for animals that reside in that state (so it would be issued for animals moving out of that state, not into that state). That may vary from state to state, so you should check with your state veterinarian if you plan to use those certificates, and ensure they are also valid for small animals. An outdated slide was inadvertently used in the presentation and we would like to provide updated information. Slide 29 had an image representing the Institute for Infectious Animal Diseases (IIAD) AgConnect mCVI. The AgConnect mCVI was discontinued in September 2018, and has been replaced by IIAD’s updated AgView CVI. There were many questions submitted by webinar attendees, and not all of them could be addressed in the hour-long session. We have compiled the questions and worked with Dr. Ragan to provide answers to the best of our knowledge. Click on a topic to expand the Q&A. How do I check my accreditation status? Check your accreditation status and find answers to other accreditation questions at https://www.aphis.usda.gov/aphis/ourfocus/animalhealth/nvap. Click on “Check my accreditation status” at https://www.aphis.usda.gov/aphis/ourfocus/animalhealth/nvap/ct_areavet. If you have not been accredited for several years, do you have to redo the accreditation process? For more information on having your accreditation reinstated, visit https://www.aphis.usda.gov/aphis/ourfocus/animalhealth/nvap/ct_reinstate. What is the fee for becoming accredited? Do I need to be accredited to create an interstate CVI for small animals? Although accreditation is needed for international health certifications and most interstate health certificates, some state veterinarians may allow small animal CVIs to be issued by licensed non-accredited veterinarians. If you are not accredited and are asked to write an interstate health certificate, be sure to check with the state veterinarian for the state of destination to see if they may accept it. Is it permitted for me to sign a health certificate for a pet I that have never examined, but that was examined by another doctor in the practice? veterinarian shall keep a copy of the certificate, form, or report and shall attach to it either a copy of the test results issued by the laboratory, or a written record (including date and participants’ names) of a conversation between the signing accredited veterinarian and the laboratory confirming the test results. For further guidance, you may want to check with the USDA accreditation contact for your state. What are the requirements for emotional support animals/service animals? Are service dogs exempt from health certificate requirements for interstate travel? Check with the state of destination as some states exempt certain species of companion animals. If the animal is flying, check with the airline for specific requirements. Is it acceptable for me to write a CVI when the owner is from a neighboring state, but is stabling a horse in the state that I practice in? An accredited veterinarian may not perform accredited duties in a state in which the accredited veterinarian is not licensed or legally able to practice veterinary medicine. If the horse is in the state you are licensed and accredited in when you examine it, you should meet the requirements. If in doubt, check with the accreditation coordinator for your state here: https://www.aphis.usda.gov/animal_health/vet_accreditation/downloads/nvap_coordinator.pdf. 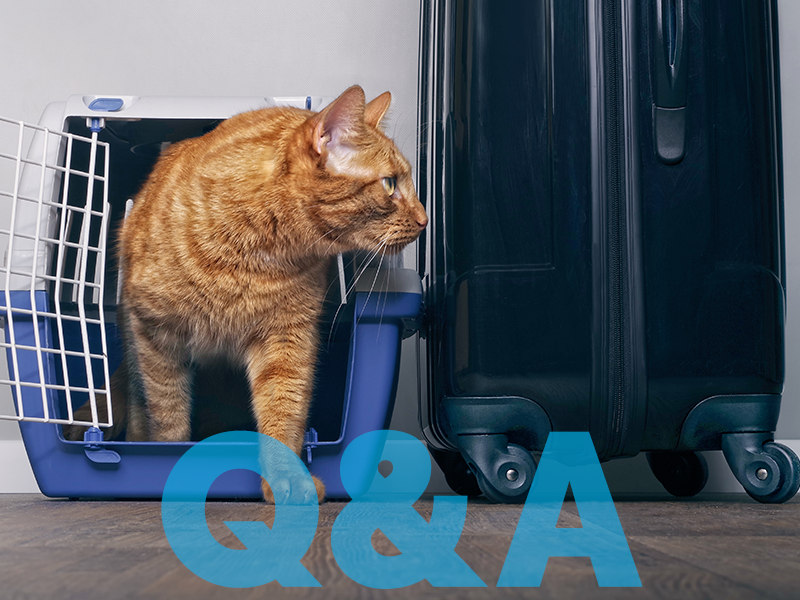 Are there regulations permitting movement of, for example, Feline Immunodeficiency Virus (FIV) positive cats who are indoor-only, whose owners are moving to another state? Movement of diseased animals is generally prohibited. More information can be found here: https://www.aphis.usda.gov/aphis/ourfocus/animalhealth/nvap/NVAP-Reference-Guide/Animal-Movement/interstate-regulations. Contact your State Animal Health Official for additional information regarding moving sick animals. How do we contact state veterinarians to inquire what certificates that state accepts? Contact information for State Animal Health Officials can be found at globalvetlink.com/regulations or usaha.org. Do you need to fill out a 7001 form for all international travel? Requirements vary depending on the country of destination. Information regarding international regulations can be found here at https://www.aphis.usda.gov/aphis/ourfocus/animalhealth/export/iregs-for-animal-exports. When will a USDA endorsement be required? In most cases of international travel, a USDA endorsement is required. Visit https://www.aphis.usda.gov/aphis/pet-travel and select a destination country to check the endorsement requirements. Any ideas on what the changes will be if Brexit occurs for clients who want to take pets to the United Kingdom? The UK will likely set their own import requirements, which may or may not be different from those of the EU. It is hard to predict what the requirements may be. It would be best to check with USDA for updated requirements. Is there another option for international travel besides APHIS 7001 form that is more reliable for countries that don’t have their own bilingual certificate? How do we handle travel to Hawaii? The most updated information regarding travel into Hawaii can be found at http://hdoa.hawaii.gov/ai/aqs/aqs-info/. Are health certificates required for travel via car across state lines? Who do they give the CVI to at the state line? Requirements are set by the state veterinarian for the state of destination. Animal owners traveling with a pet are not generally required to turn the CVI in, but should have one available if required. Check with the state veterinarians office for the state of destination for specifics. How do you approach a CVI for a client who is traveling throughout the US with no true destination? Please check with your State Veterinarian’s office for guidance. They would have more experience with situations such as this. Are the VSPS certificates accepted by all 50 states? Yes, VSPS certificates are accepted in all 50 states, but they are not available for companion animals. Are there any states which don’t accept digital CVIs? GVL digital certificates are accepted in all US states and territories. For other digital certificates, you will need to check with the provider and your state animal health official. Do required remarks vary from state to state? The requirements are determined by each state veterinarian, so yes, they may vary from state to state. Do you print digital CVIs for travel on airlines? Would viewing the certificate on a phone be adequate? It is suggested that CVIs be printed for airline travel at this time, but check with the airline as their rules are subject to change. How long is a CVI / health certificate good for? A Certificate of Veterinary Inspection (CVI) or health certificate is valid for 30 days. Will a digital CVI take the place of the APHIS 7001 form for international travel? No. Currently, there is no digital solution for international certificates. Are state based health certificates still accepted in hard copy form given that they all have unique ID numbers? Hard copy certificates are still accepted in most states. If you are questioning if a certificate will be accepted, it is best practice to contact the state veterinarian of the destination state to ensure they still accept the certificate form you are using. Which states are still accepting the 7001 form? To see the most up-to-date map of the states still accepting the 7001 form, visit globalvetlink.com/7001form. Is the 7001 form still being printed? The APHIS 7001 form is available only as a fillable PDF on the APHIS USDA website. Is it the endorsement process that makes the 7001 form acceptable for international travel, while it isn’t accepted in some states for interstate travel? Are GVL CVIs accepted by all 50 states? Yes, GVL digital health certificates (CVIs) are accepted in all 50 states as well as the US territories. Does SmartEngine work for international CVIs or just domestic? Currently, the GVL platform, as well as SmartEngine, can only be used to create domestic CVIs. What veterinary software does GVL interface with? The GVL platform currently integrates CVIs with INOVA, ImproMed and HVMS. Consignor is the owner of the animal(s). In the case of travel, Consignee should be listed as the same as Consignor (the animal owner). In the case of a sale, Consignee would be the new owner. How is request for permit number handled? To obtain a permit number, the veterinarian can complete the certificate and then click Get Certificate Number. This locks the CVI from further editing and will provide them with the certificate number to provide to the state to obtain the permit number. Once they have the permit number, they can enter it on the certificate and sign the certificate. Does the MyVetLink app have the ability to upload medical records (such as diabetes records, etc.)? The veterinarian has the ability to attach additional records to a CVI. At this time, animal owners cannot upload additional records themselves in the GVL MyVetLink app. Are photos or a detailed description required for dogs/cats like they are for equine? Is there a place to upload a photo if you want to? Photos and descriptions are not required for small animals, but photos and descriptions can be added to the animal profile. Do you have any forms to help facilitate the transfer of all necessary information from the client to the software? In other words do you have something we can have our client fill out and then use to create the certificate. GVL can provide clinics with a client information form as a fillable pdf to email or print, which can be shared with clients to fill out before you create a health certificate / CVI. You also have the option of creating the CVI and printing a copy of the CVI preview before signing. You can use this as a double check with your client to ensure that everything on the certificate is correct before the veterinarian signs it. Can a copy of the CVI be printed for a trucker or other associated party? Yes, physical copies of the certificates can be printed by the veterinarian or animal owner. Is there room for complete animal ID (name, brand, etc.) for animals other than small animals, such as rodeo bulls? Animal profiles within the GVL platform can include multiple ID types (registered name, microchip, brand, etc.). There is also a section within the animal profile that will allow you to include a brand description and image. Can we prefill the CVI prior to an appointment and then edit the CVI if the owner provides us with additional information? Yes, you can enter the information on the CVI and then save it as a draft. Once you have the correct information, you can edit the draft and then sign the CVI. For Carrier, does it need to be the airline or can it also be the individual traveling with the animal? When traveling by air, if the animal will be traveling under the wing, the airline be listed as the Carrier. If the animal is traveling in the cabin with the owner, the owner should be listed as the Carrier. If traveling by car, the animal owner should be listed as the Carrier. Can changes be made to a completed CVI? Once a CVI has been signed by the veterinarian, it cannot be edited. This is due to regulatory restrictions, as the CVIs are immediately submitted to both the state of origin and destination at signing. CVIs can be previewed before being signed, which gives you the chance to ensure that all of the information is correct before signing. Should you have an error with a final CVI, you can void the incorrect certificate and create a new one. Can clinic support staff (such as CSRs) enter the info in GVL for CVIs and then have the veterinarian sign, or is the vet the only one with access? Clinic support staff can be setup with accounts in order to enter client and animal information. Only the veterinarian is able to sign the certificate. Can intrastate health certificates for fairs or shows be completed through GVL? Yes, GVL CVIs can be used for intrastate health certificates, as well. Is there a simple way for animal owners to access their documents? Yes. You can add a client’s email address to their profile in GVL and grant them access to MyVetLink. They will then receive information on signing up for their MyVetLink account. Through a MyVetLink account and the MyVetLink app, animal owners have 24/7 access to their completed certificates. The MyVetLink app is available in the App Store and Google Play for both Android and Apple devices. Does GVL’s digital Equine Infectious Anemia (EIA) / Coggins test form allow you to add digital photographs of the horse instead of having to “draw” them? Yes. The GVL platform allows you to upload images of horses to digital EIA / Coggins test certificates. You can use GVL’s free HorseSync app to collect horse information and photos and add them to the animal’s profile. Profiles created through GVL HorseSync will automatically be uploaded to your GVL account. Want to watch the Small Animal Requirements webinar online? Visit our previous blog post for additional resources and information from the webinar.